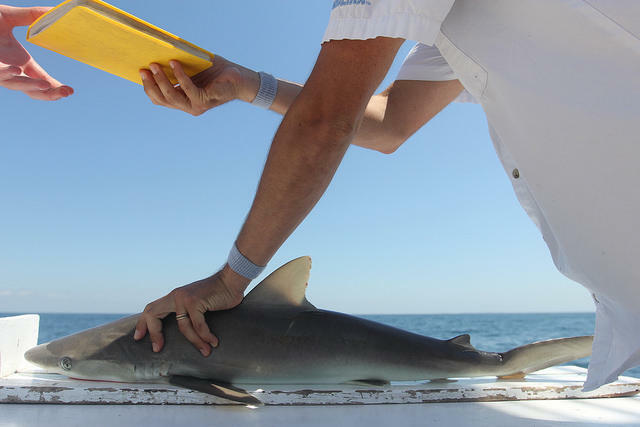 Sharks are brought aboard, measured, tagged, and have a small fin clip taken for genetics research. Within a minute or two of being brought on board the animal is released back into the water. One of the longest running shark surveys in the world is taking place off the coast of North Carolina. For the past 45 years, researchers at the University of North Carolina’s Institute of Marine Sciences have been catching and tagging a variety of shark species in an effort to determine the health of the ocean and measure changes in shark populations. 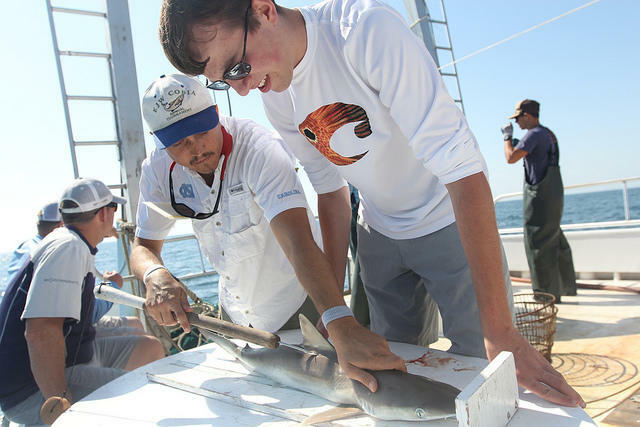 Martin Beneavides, a Ph.D. candidate at the University of North Carolina’s Institute of Marine Sciences in Morehead City heads up the offshore research trips which take place every two weeks between April and November. The surveys are conducted at locations two miles and seven miles off the coast of Shackleford Banks. The crew aboard the M/V Capricorn assists the researchers with bating 100 hooks and attaching them a longline, which stretches for nearly a mile. After the longline is allowed to “soak” in the water for an hour, the crew reels in the cable using a winch. The longline surveys collect information on about half of the more than 45 species of sharks that are found off our coast. The most common shark they catch, Beneavides said, is the Atlantic sharpnose, which grows to be three feet in length. 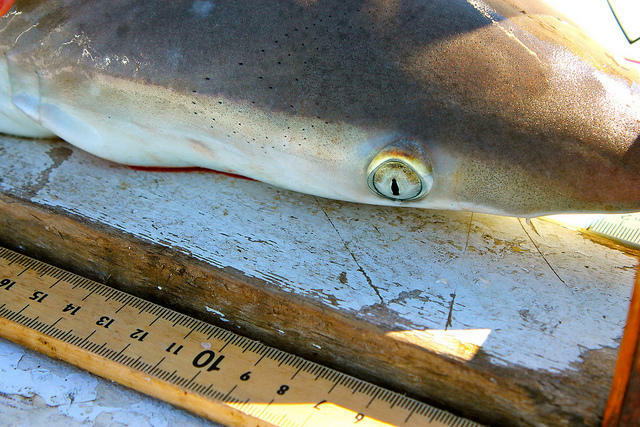 As sharpnose sharks increase in population, data from the surveys shows blacknose shark numbers have been declining. Researchers noticed a significant decrease in large bull and tiger sharks in the 70’s and 80’s due to overfishing. 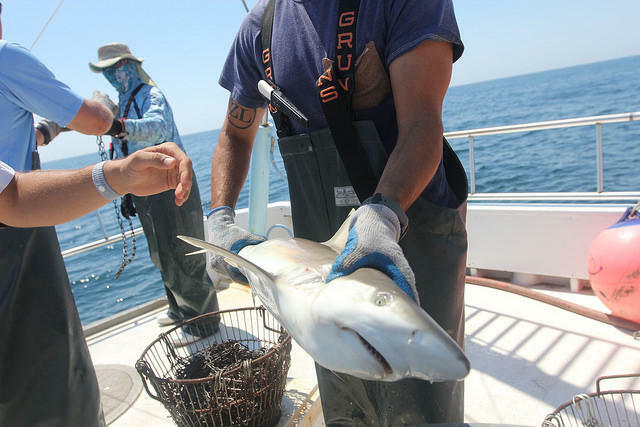 During a shark survey on June 27th, a total of 25 sharks were caught, the highest daily catch in the study’s 45-year history. A sign for optimism, Beneavides says, is that they’re starting to see some shark species that were declining making a comeback.